Windows provisioning makes it easy for IT administrators to configure end-user devices without imaging. Using Windows provisioning, an IT administrator can easily specify desired configuration and settings required to enroll the devices into management and then apply that configuration to target devices in a matter of minutes. It is best suited for small- to medium-sized businesses with deployments that range from tens to a few hundred computers. A provisioning package (.ppkg) is a container for a collection of configuration settings. With Windows 10, you can create provisioning packages that let you quickly and efficiently configure a device without having to install a new image. Provisioning packages are simple enough that with a short set of written instructions, a student or non-technical employee can use them to configure their device. This can result in a significant reduction in the time required to configure multiple devices in your organization. The Windows Assessment and Deployment Kit (ADK) for Windows 10 includes the Windows Configuration Designer, a tool for configuring provisioning packages. Windows Configuration Designer is also available as an app in the Microsoft Store. The tool for creating provisioning packages is renamed Windows Configuration Designer, replacing the Windows Imaging and Configuration Designer (ICD) tool. The components for creating images have been removed from Windows Configuration Designer, which now provides access to runtime settings only. Windows Configuration Designer can still be installed from the Windows ADK. You can also install it from the Microsoft Store. Windows Configuration Designer adds more wizards to make it easier to create provisioning packages for specific scenarios. See What you can configure for wizard descriptions. The wizard Provision desktop devices (previously called Simple provisioning) now enables joining Azure Active Directory (Azure AD) domains and also allows you to remove non-Microsoft software from Windows desktop devices during provisioning. When provisioning packages are applied to a device, a status screen indicates successful or failed provisioning. Windows 10 includes PowerShell cmdlets that simplify scripted provisioning. Using these cmdlets, you can add provisioning packages, remove provisioning packages and generate log files to investigate provisioning errors. 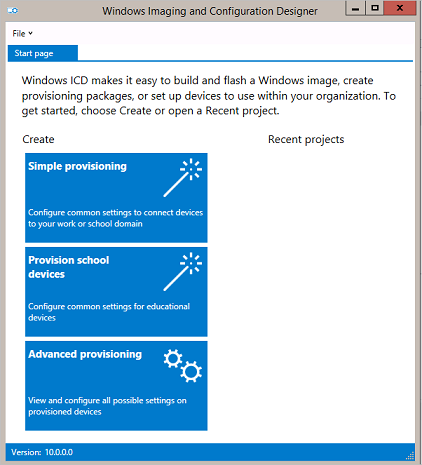 The Provision school devices wizard is removed from Windows Configuration Designer. Instead, use the Setup School PCs app from the Microsoft Store. Quickly configure a new device without going through the process of installing a new image. Save time by configuring multiple devices using one provisioning package. Quickly configure employee-owned devices in an organization without a mobile device management (MDM) infrastructure. Set up a device without the device having network connectivity. Installed using removable media such as an SD card or USB flash drive. Downloaded from a network share. Deployed in NFC tags or barcodes. The following table describes settings that you can configure using the wizards in Windows Configuration Designer to create provisioning packages. Before you use a Windows Configuration Designer wizard to configure bulk Azure AD enrollment, set up Azure AD join in your organization. Add applications Install applications using the provisioning package. Add certificates Include a certificate file in the provisioning package. Developer Setup Enable Developer Mode. After you start a project using a Windows Configuration Designer wizard, you can switch to the advanced editor to configure additional settings in the provisioning package. The following table provides some examples of settings that you can configure using the Windows Configuration Designer advanced editor to create provisioning packages. * Using a provisioning package for auto-enrollment to System Center Configuration Manager or Configuration Manager/Intune hybrid is not supported. Use the Configuration Manager console to enroll devices. For details about the settings you can customize in provisioning packages, see Windows Provisioning settings reference. This section is retained for customers using Windows 10, version 1607, on the Current Branch for Business. Some of this information is not applicable in Windows 10, version 1703. Windows ICD for Windows 10, version 1607, simplified common provisioning scenarios. Simple provisioning – Enables IT administrators to define a desired configuration in Windows ICD and then apply that configuration on target devices. The simple provisioning wizard makes the entire process quick and easy by guiding an IT administrator through common configuration settings in a step-by-step manner. Learn how to use simple provisioning to configure Windows 10 computers. Advanced provisioning (deployment of classic (Win32) and Universal Windows Platform (UWP) apps, and certificates) – Allows an IT administrator to use Windows ICD to open provisioning packages in the advanced settings editor and include apps for deployment on end-user devices. Windows ICD in Windows 10, version 1607, also provided a wizard to create provisioning packages for school PCs. To learn more, see Set up students' PCs to join domain.